With the recent release of the 300th figure, Good Smile Company have done something of a soft relaunch, or at least a minor rebranding, of their Nendoroid figure line. After all, at 300 entries, it’s probably one of the biggest series of specifically branded figures outside of the low-end capsule-machine brandings like Bandai’s HGIF, but at this point they’re facing increased competition from other manufacturers finally launching ranges in the same size and price point regions. It’s kind of an interesting rebranding as well, in a sense – I don’t actually follow any of GSCs social presence, even though they do things in English, but it definitely feels like they’re playing up to the series popularity outside of Japan with their new packaging style (despite the “For Sale In Japan Only” moniker still displayed on the back). The Romanized version of the character name is now more prominent than the Kanji one, and the sculptor information on the front is now in English, the Japanese demoted to the back of the box. Whilst the traditional Nendoroid “Something Something Action Figure!” line in Japanese is still displayed on the front-left, the box also features slightly-awkward English lines like “Cute to look at, fun to play with and great to collect Nendoroids!” all over it. Although it is kind of unfortunately that the rather cleaner, less busy graphic design of it all does actually end up making it more like, say, the competing Cupoche packaging than the busier, older ones did. It’s also kind of unfortunate that the two Hidamari Sketch characters they’ve released as part of the series ended up juuuuuust either side of the rebranding, cursing the boxes not to match, despite being released barely a month apart. 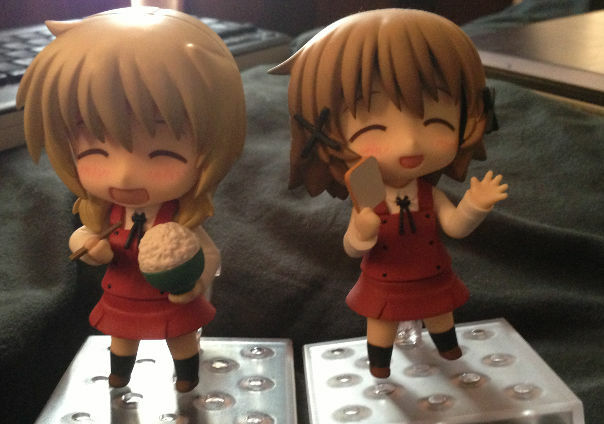 I elected to display my Hidamari’s in the “really excited about food” poses. 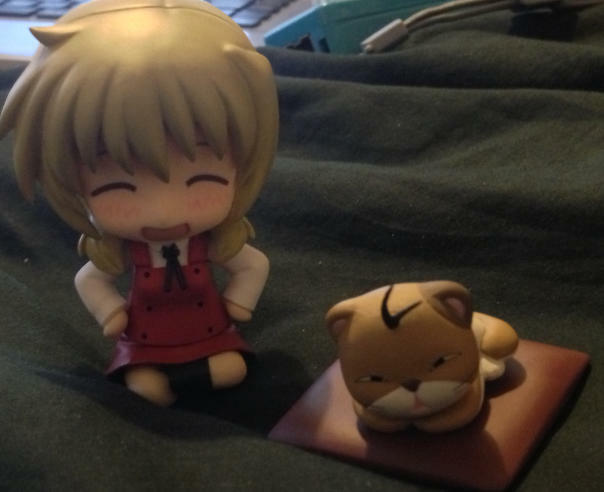 I suppose there’s a limit to how exciting they can make a Hidamari nendoroid – there’s not really too much in the way of appropriate gimmickry you can pull off in the way of costuming or accessories with them, really. 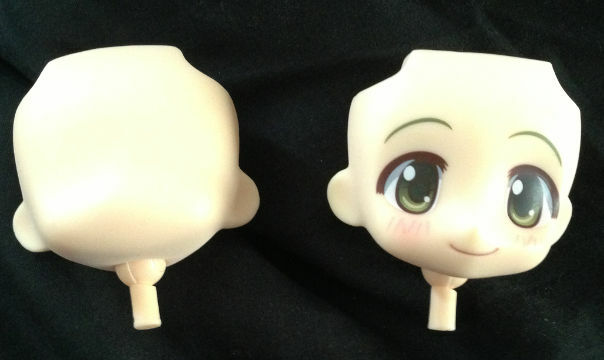 The one gimmick they did decide to do with them is to have the third face-part which came with them be entirely blank. If you are wondering what the point of that is, well, each figure comes with a set of stickers, aligned as four different facial expressions for each (though you can mix-and-match parts). For a show which sports a lot of amusing, often wide, facial expressions, it’s probably the next best thing to the rather unrealistic choice shipping them with a half-dozen facial parts each. 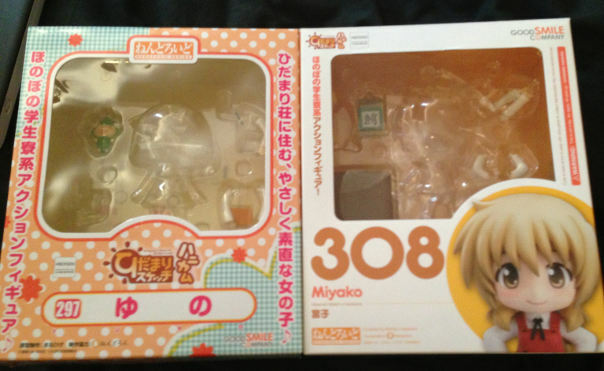 Also, Miyako comes with two different sizes of adhesive 3D drool drops, for differing levels of food-induced salivation. The issue with the stickers is that they’re actually kind of difficult – at least for someone as cack-handed as myself – to get on there in not only the right place, but without creases on the stickers. Miyako has her hair tied in a short ponytail. Unlike what they’ve been doing with some of the genuinely long-haired characters, like Bodacious Pirates Marika – where they put a metal plate in their hair to allow the use of a magnetic clasp – they’ve provided an extension to the arm which sneaks in just under it. 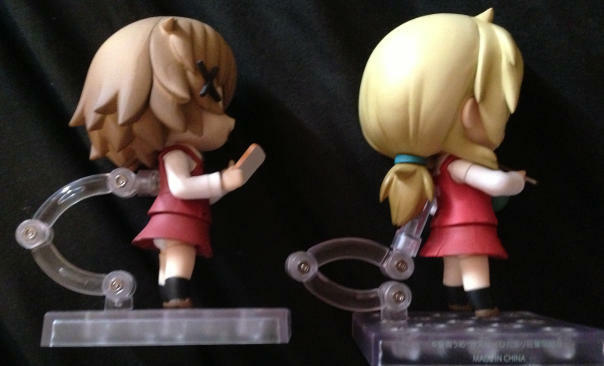 This also means that the usual Nendo stand arm basically has to be swung down as low as it possibly can. It also makes it really hard to use with other Nendo’s parts – whilst she wouldn’t fit with Hibiki’s body anyway, due to the hair she has on her shoulders not fitting with Hibiki’s shoulderpads, I actually had to remove the ponytail in order to get her onto Marika’s body. It’s not something I’m inclined to do too often, as I always worry about those ball-jointed parts breaking whilst removing or reinstalling them. Anyway, as was pointed out on Twitter, I now need a cake-sporting Hiro to complete my collection of food-obsessed Hidamaris. 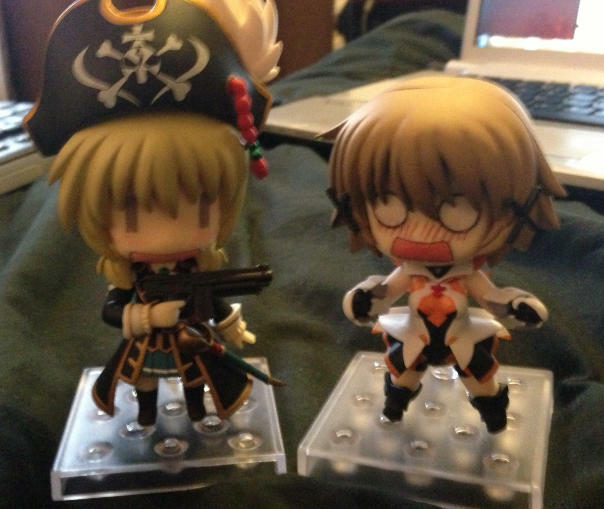 My two nendoroids happen to be ojou-sama and her imouto-sama. Wearing each other’s hats. They are trying to tap into the overseas market, given that you can order internationally directly from them. Probably due to local market saturation. Between the cupoche and the nendoriods, I prefer the nendo SDness.